I’m coming up on 23 years as a professional truck driver. 23 years!! Wow, never thought that I would be doing this for that long. My initial plans were to drive a truck for 2-3 years then open my own trucking company. Well, needless to say, that didn’t happen. I thought about it for a long time but decided that having my truck leased to a company would be better. During my many years of travel (work), I took a lot of pictures. At one point, I teamed up with a friend and went further than I ever would solo. Who would have thought I would be in Washington state or Oregon? I have picked up and delivered in 46 states. North Dakota and Maine are the only ones I have not traveled in. Music has taken me across the U.S. and back. Don’t know how I could have made it without it! I have tried to take as many pictures as I can in each state. Most of the pictures were taken with a little 3 mega pixel camera, which took some amazing pictures. I have added some of my many pictures below. 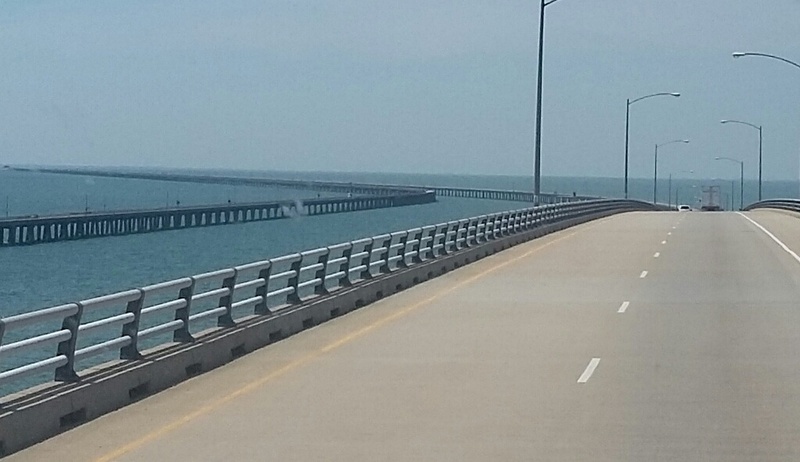 Chesapeake Bay Bridge and Tunnel, located on Route 13 to runs to the Eastern Shore of Virginia. There are so many people who are afraid to cross this bridge because of the large amount of water underneath. The only time I am afraid is when the wind is blowing and the water is splashing up on the bridge. Yeah, that’s super scary! 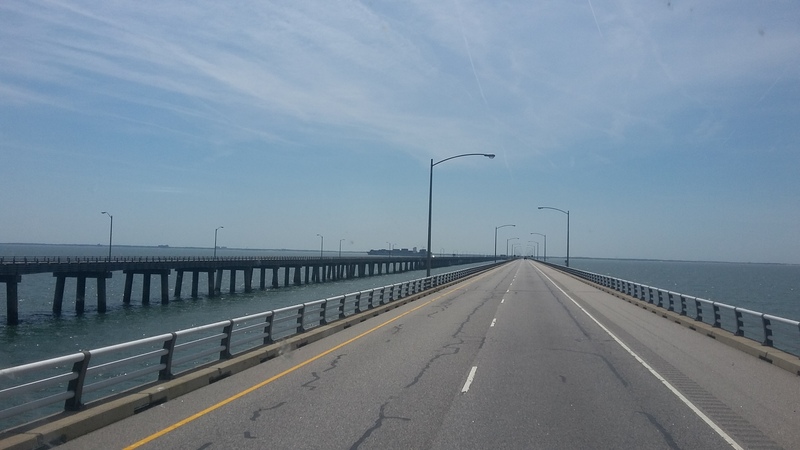 I guess it’s not so bad when you cross this bridge in a car, but imagine crossing in a big truck, a high-profile vehicle, you have to slow your roll and pay closer attention to what’s going on around you. The scenery off this bridge is beautiful! Nothing but water for a few minutes, ships crossing over the tunnel, you may be able to catch a picture or two when that happens. My view maybe a little better than others because I sit up higher. 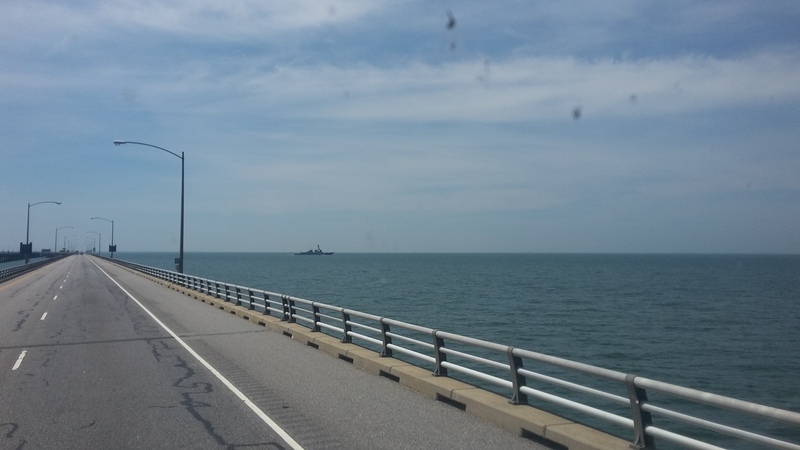 There is a restaurant located at the first tunnel you come to when crossing from the Norfolk side called The Virginia Originals & Chesapeake Grill. I have not had the chance to stop through but I am sure it’s good. You can get any fresher seafood than being right on the water. The many reviews I’ve read, some good some bad, but you can say that about any establishment! The speed limit is where it should be. Traveling any faster may create problems you don’t want. I don’t think that you will ever be that thirsty! The best time to cross is only when its a clear sunny day, so you can see everything! It is totally amazing! The Federal Motor Carrier Safety Administration is set to publish Monday, March 7, a proposed rule that, if made final, would implement a required core training curriculum for prospective truckers before they receive their CDL. The curriculum notably includes at least 30 hours of behind-the-wheel training before being issued a CDL. The Entry Level Driver Training rule’s implementation would take place three years after its final publication in the Federal Register, which will come after the agency takes public comment for 60 days on the proposal and makes any changes to the rule based on that feedback. The proposal then would have to be approved by the DOT and the White House’s Office of Management and Budget before being published. The three-year countdown to its implementation would begin then. The proposal, unveiled Friday, March 4, by FMCSA, in addition to the core curriculum and behind-the-wheel requirements, seeks to establish a registry of FMCSA-approved driver training providers. FMCSA’s rule outlines minimum qualifications related to instructors, testing, training vehicles and more that the agency will use to approve training providers for the registry. The agency is accepting public comment on the rule for 60 days, starting Monday. Visitregulations.gov then and serach for docket number FMCSA-2007–27748 to see the rule and to file a comment. 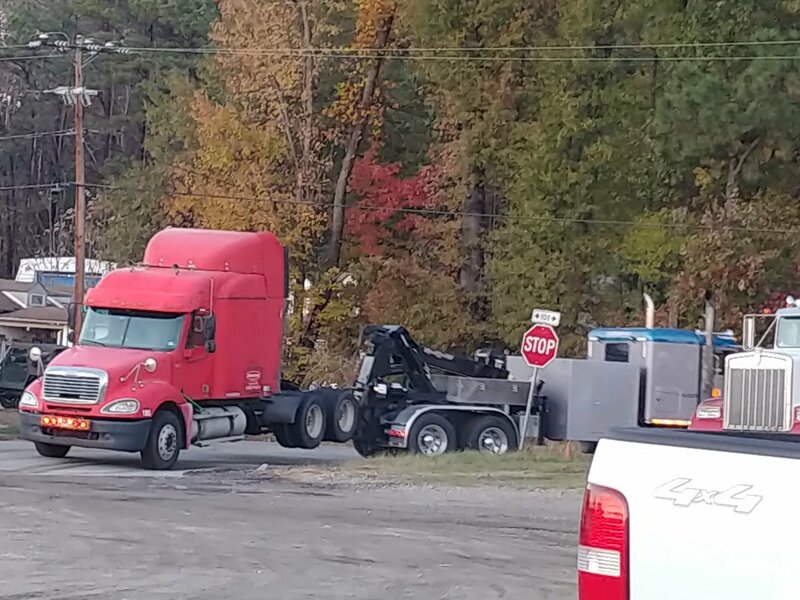 The rule will apply to all drivers required to complete a CDL skills test to obtain a CDL and to those upgrading their license from Class B to Class A. The curriculum for those seeking a Class A license is broken down into two categories: Theory and actual driving time. The theoretical component includes required training on basic vehicle instruments and controls, basic operation of a vehicle, how to perform a vehicle inspection, controlling a vehicle under various road and traffic conditions, how to shift and back a vehicle, hours of service, handling cargo, crash procedures, fatigue awareness, vehicle maintenance and violations, trip planning and more. The driving time component of the rule requires operators to spend at least 30 hours behind the wheel before receiving a CDL, with at least 10 of those hours spent on a driving range. How the other 20 hours are received will be determined by the training providers, but the rule does stipulate that drivers must drive at least 10 of them on a public road or take 10 public road trips of no less than 50 minutes each. Overdrive will have more on the rule and its requirements in the coming weeks.